Just massage his huge ego and vanity, and hey presto. . . . the "enemy" becomes the latest fashion friend. Noted and shared over social media. Is anyone surprised at this??????????????? Of course it is unacceptable - like so much, Trump's ethics are non-existent. After-Trump governments are going to be very busy locking off all the legal loopholes that Trump & Co have shown up ... loopholes that have existed but never been (ab)used since presidents have systematically respected certain ethical norms ... until Trump. At least - I HOPE they are going to be doing so. 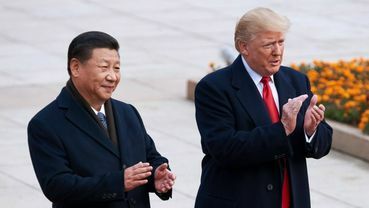 I've had my eye on Trump and China for a while, ever since one of the first people he hung out with after he was elected was the head of the huge company Ali Baba, one of the richest men in the world Jack Ma. I remember them emerging from a meeting, with Trump looking like the cat that swallowed the canary, as they say. He would sell out this country in a heartbeat. Thanks Sheryl. I forgot to add that this is a very good article, with some interesting links within it for those who have time. Margie "okay"- meaning you are okay with a President selling out his Country for his own personal gain?? ?